Fangirl tells the story of Cath, a young writer of Simon Snow fanfiction who’s about to start college. In Rainbow Rowell’s fictional world, Simon Snow occupies more or less the same cultural space Harry Potter does in ours, and the novel is set in the months before the release of the final book in the series. The story Cath has been working on has become known in the fan community as the year seven fic, and the pressure is on for her to finish it before the final book’s publication. Cath’s writing never stops mattering to her, but once she starts college she has to learn how to balance it with the several challenges life throws her way. First of all, there’s the fact that her twin sister and best friend, Wren, has decided that college would be a great opportunity for the two of them to spend some time apart and meet some new people. On top of that, Cath is convinced that her new roommate hates her; she’s not eating properly because she’s too worried she’ll make a fool of herself in the cafeteria; she’s having trouble managing her social anxiety; she’s worried about her dad, who’s all alone back home; and she misses her sister terribly. As the months pass and Cath adjusts to her new life, she learns to carve out the necessary space in her life for her new passions and connections, all without leaving the old ones behind. Cath doesn’t think she’s good at life — but she’s really good at being a fan. She’s been writing fanfiction since she was twelve, and she’s gotten kind of famous in that world. But college is another “story”. She’s got a mean roommate (with a too-friendly boyfriend), her twin sister’s ignoring her, her dad’s a mess, her writing professor is pushing her too hard… She keeps having to rise to the occasion, but all she really wants to do is stay in her room and write. Is Cath ready to live her own life, write her own stories, and open her heart to someone? Or will she just go on living inside her fictional world? That last sentence is particularly cringe-worthy — false dichotomy, anyone? The pleasure and joy people get out of engaging with literature through fanfiction isn’t something that exists apart from or in opposition to their real lives, and the stories they write are very much their own. The good news is that Fangirl’s portrayal of Cath’s relationship with fanfiction is infinitely more nuanced than that holy mess of a blurb would have you think. This isn’t a story about a girl who goes to college and leaves fandom behind because she now has a “real” life; it’s a story about a girl who goes to college and continues to write fanfiction because it matters to her. In fact, the most meaningful and satisfying connections Cath develops are with people who understand what fandom means to hear, who respect it, who are open to it, who invite her to share it with them so they can grow closer — all of which was absolutely lovely to see. There were two major minefields Fangirl could easily have waded into, and I want to look at them one at a time. The first is the portrayal of fandom as an evasion from “real” life; the second is painting fanfiction as a mere stepping stone towards “real” (aka original) writing. I think the novel does a good job of avoiding the first: the happy, well-adjusted Cath we get at the end of Fangirl is still a fanfiction writer. She doesn’t disown that part of herself; she doesn’t outgrow it; she doesn’t “learn better” in any way, shape or form. Having said this, there’s still a potential issue of representation here that I think is worth addressing. 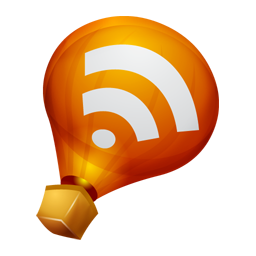 There aren’t exactly many mainstream stories about fanfiction writers out there, so a lot of people are going to look at whichever ones they happen to encounter as telling The One and Ultimate Truth. This isn’t poor Fangirl’s fault, and at the end of the day it’s really just one more sign that we need all the stories we can get. However: Cath is a socially anxious and withdrawn girl who writes in part to escape; at one point she actually says that she “writes to disappear”. I don’t think there’s anything wrong with seeking refuge in stories when life gets overwhelming — in fact, I think the concept of “escapism” gets oversimplified all the time. But people don’t read or write fiction just to leave their lives aside for a moment; very often they do it because they want more out of life, and stories happen to be a perfect way of getting that. If I read Fangirl generously, I can see that it implicitly acknowledges this by having fandom continue to matter to Cath even as she becomes happier and forges more social ties. But there are still aspects of her story that fit into the dominant narrative about those poor, lonely, isolated fandom people all too well. Before I move away from this subject, I want to add that I adored Cath: she’s wonderfully complex and very much herself, and I don’t for a second mean to imply that you can’t write a character who starts out lonely and isolated and suffers from social anxiety, lest she be used to make assumptions about a whole group of people. Looking at the wider cultural context that a specific narrative fits into is always worthwhile, but so is being careful not to dismiss a character or erase her humanity just because she happens to match a particular trope. I want stories about girls like Cath to continue to be told, but preferably in parallel with stories about completely different people who also happen to be involved in fandom. So that’s potential problem number one. Potential problem number two is more complicated: I’m not entirely sure where Fangirl stands on the whole fanfiction-is-just-training-for-writing-“real”-fiction issue. Here’s something that gave me pause — there are excerpts from Cath’s fanfiction in between the chapters of Fangirl, but this pattern is broken at the very end, when we get an excerpt from Cath’s original fiction instead. And I can’t help but wonder if this arrangement frames Cath’s writing as a progression towards that particular story, about the time her mother left home. Again, there is nothing wrong with representing this kind of experience: there will be people who’ll feel ready to write original fiction after writing fanfiction for a number of years, and there’s absolutely nothing wrong with that. But, again, I find this worth exploring because it plays into a dominant assumption about people’s relationship with fanfiction. 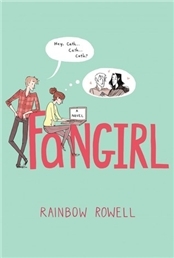 As before, if I read Fangirl generously I can see how the story it tells is more complicated than that: there’s nothing in the text that tells us Cath has now left fanfiction behind, and the reasons why she couldn’t tell that particular story aren’t merely about her investment in fanfiction. It was a raw, painful experience that she needed to process before she was able to drawn from it in her writing. However, the fact remains that the progression narrative and the fanfiction-as-a-refuge-from-life narrative are still there, and I can’t help but wish they’d been unpacked a little further. Before I move on, I thought it might be wise to include a brief disclaimer about my perspective on these matters. I’ve never had any direct involvement in fandom myself, though I know and respect some people who belong to fan communities. This lack of a personal connection undoubtedly affected how I read Fangirl — not in the sense that it made me magically objective, but in the sense that it made me less sensitive. You’re always more aware of how experiences close to your own are portrayed in fiction, especially if they have a long history of being maligned or misrepresented. And I’m telling you this because I don’t want you to read my explorations as any sort of authoritative take on how Fangirl portrays fandom. My understanding comes from making certain parallels with my own life: for example, you might remember that I’m generally sensitive to fictional portrayal of relationships forged online. It worries me that the stories we tell about them nearly always frame them as fake and fraught with danger, and this was something that really got in the way of my enjoyment of Will Grayson, Will Grayson. I do of course realise that there are people who have had that kind of experience, and of course I don’t want to silence their stories. By the same token, there might be people for whom fanfiction works as a stepping stone towards other kinds of writing, as well as people who use it to cope with stressful life events — and there’s nothing whatsoever wrong with that. But I can easily imagine my friends groaning when they find this story again, just like I groan when I come across certain kinds of Internet-based deception and betrayal stories for the nth time. We need counter-narratives; we need a wider range of experiences to be made visible. Fangirl is much more complicated and nuanced than the jacket copy makes it sound, but it can’t include every angle, represent every kind of fandom experience, be all things to all people — no single story can. But even so, it’s going to be scrutinised closely, because for now it pretty much stands alone. And that is the whole issue. It’s a campus novel and a coming of age novel. I love stories about people adapting to college; about people on the brink of adulthood; about people in unfamiliar situations; about people at the intersection between two very different phases of their lives. Fangirl is all of that and more. Cath herself, who is smart and awesome and unreasonable and sensible and complex and just incredibly human. Cath and Wren’s wonderfully complicated relationship, plus their family dynamic as a whole, plus the fact that the mother who left them at a young age isn’t dehumanised. Cath doesresent her immensely, but her emotional reaction is validated in a way that still allows her mother’s very difficult side of the story to emerge. She left, and that was a really crappy thing to do to her young daughters. But her own story — pregnant with twins at a young age, a career left behind, choices made because there were no other real options in that particular time and place — is also painful and difficult, and we’re allowed a glimpse of the full complexity of her situation. Additionally, Wren makes a different choice than Cath when it comes to resuming contact with her mother, and the novel doesn’t frame one of them as right and the other as wrong. There is no right and wrong when it comes to how to cope with something like this; there are only individual choices. The honest portrayal of social anxiety, plus the inclusion of a parent with a mental illness who is fully humanised. It doesn’t quite reach 10PM Question levels of perfection, but it’s very nearly there. The wonderful, wonderful Levi, and the lovely, sweet, slowly developed romance. It has everything: will-they-won’t-they suspense, sexual tension in spades, an emotional and intellectual connection, and eventually hot and tender makeout scenes. I also loved the way Levi is portrayed: he’s an Agricultural Science major who’s not very comfortable with reading but who absorbs information with great ease if he listens to it instead. He copes with college by recording his lectures and getting the audiobook versions of his textbooks whenever possible, or, failing that, by getting someone to read things out loud to him. And needless to say, none of this means he isn’t smart. I loved how Rowell challenged the assumption that there’s a link between confident literacy and intelligence, as well as stereotypes about rural communities and shallow ideas about what makes people compatible. The fact that the romance, important though it is, is framed as merely one of several important connections. There’s also Cath’s relationship with her sister, her link with her father, her mixed feelings about her mother, the new friends she makes at college, her admiration for her writing professor, etc. The romance was lovely and satisfying, but it wasn’t the total sum of Cath’s emotional life. Which brings me to: Cath and Reagan’s friendship and how they negotiate the Levi thing (Reagen, Cath’s roommate, is also Levi’s ex). Like adults! By talking! With trust and respect and handy ground rules! There’s no inevitable fallout; no destruction of their friendship because a boy comes between them. They decide what they want, talk about what they’re comfortable with, and look and behold, they succeed. I’ll leave it at that, but honestly, the above list could have been twice as long. Fangirl is not a short novel, but I breezed through it and never wanted it to end. Rainbow Rowell has cemented her place among my favourite authors, and I can’t wait to find out what she’ll write next. You've made me even more excited about this book! As I said in our e-mails and as I'll say in my review (which goes up on Monday), the major fannish thing I was missing here was a sense of the community in "fan community." This is a very even-handed review, especially concerning the problem of the one representation. I skipped half your review because now I want to read the book, and then come back to what you said. I don't write fan fiction, or read it, but I'm intrigued by the fact that people do. And I read the link defining "slash fandom" and laughed aloud: there's a word for that?! I never knew. I struggled with this one in spots, though I think my buddies who are far more into fanfic might absolutely be head over heels for it. I found bits unbelievable (Cath and Wren? Really? ), but overall I still enjoyed Rowell's writing a lot and I'm looking forward to Attachments. I'm really excited to read this one as I was a fanfiction writer during my college years as well. I've never read anything about a fanfiction writer so that premise tugs my heartstrings already. Really interested to see what I think of it! I'm very curious about this book and preordered it. I'm glad you liked it. and lol what you say about the one story/limited stories thing etc is pretty much what I wished I could have said in my post today. Thanks for always managing to say the things I think! I love your review if this one. Like you I've loved Rowell's other work, but I was a but nervous about this one when I started reading some if the descriptions. I think it's easy to dismiss reading or watching cult TV shows etc. as escapism. It's much more complex than that and I'm glad Rowell didn't fall in that trap. Looking forward to reading this one, but I'll try to keep my expectations in check. This review is so amazing. I haven't read Fangirl (but will as I loved Attachments and Eleanor & Park). What you have said here makes me all the more excited to get to it. One of my favorite things about Rowell is her multi-dimensional characters and situations. I'm pretty excited about this one too. And I haven't even read Eleanor and Park yet (even though I did buy it on Kindle so that counts for a little). I'm a little more excited about Eleanor and Park (which everyone seems to have loved with an unqualified love) than I am about this one, but both look wonderful. I really enjoyed your review of this novel. I loved how you explored all the angles - but still acknowledged that no one book can get them all. But I totally get how worrying it can be that people will take Fangirl as the Ultimate Fanfiction Authority. That being said, I thought the use of fanfiction in this novel was a representation of Cath's fear of change. Based on her own descriptions of it (which, as you've noted, are not the only reasons people write fic), she writes it because it's comfortable, and because the world and characters are already established so she feels less self-conscious about writing in that world. However, she's terrified of writing original fiction on her own because there ARE no barriers or limitations or pre-established definitions. It felt to me like in fanfiction, she felt supported by the author's canon, the way a teenager's life is supported by her family and the familiar when she's at home - and by writing original fiction, she's leaping into an endeavour that's entirely her own. She's on her own, in the literary sense, the way that she's on her own at college. Not that original fiction is better or worse, but different in way that symbolized everything Cath was going through. Great job reviewing this book. And I loved all of your discussion about the topics that the book brought up with you. These are the kind of reviews I need to start writing about the books that I read. I especially love your call for more counter narratives that acknowledge the varying experiences people have in life. And that is what keeps me reading because as wonderful as it is to see myself in characters, it is also wonderful to read about people who are nothing like me. I loved this for so many reasons too, but I just want to mention one aspect of what you said (since I could talk forever about all of them!) It is "I’m not entirely sure where Fangirl stands on the whole fanfiction-is-just-training-for-writing-“real”-fiction issue." I thought one could ALMOST see that whole thing as a meta statement that that preconception is just a joke. Because writing about her mother leaving is just as much taking characters she already knows and writing about them as it is with Simon Snow. I just heard Matthew Quick say (and a zillion other authors say too) that yes of course all of his stories contain aspects from his own life but he changes things up a bit. How is that different from the fanfiction thing? And maybe that IS the point Rowell is trying to make? Or am I the only one who thinks that? Thanks for your thoughtful review. You have piqued my interest in Fangirl.